The discs located between vertebrae create and form the spine, allow for movement and bear the weight placed on the spine. Discs are made up of a tough outer layer and a gel-like inner layer. When a disc is compressed, pressure builds up in the inner layer, causing the disc to bulge. In a prolapsed disc, this bulge presses on a spinal nerve root, causing numbness, pain or weakness. Most prolapsed discs are found in the lower back, but are occasionally seen in the neck and upper back. Compressing the nerve can cause nerve pain that is felt in another area of the body. Bowel and bladder incontinence are possible, but are usually seen in patients with a more advanced form of prolapsed disc. 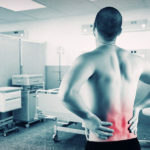 A physician may diagnose a prolapsed disc by ordering an X-ray of the area to rule out other causes of the pain, a CT or MRI scan to examine the intervertebral discs or a nerve conduction study (NCS). Treatments for prolapsed discs are similar to those for herniated and bulging discs. The doctor may order physical therapy, weight loss, healthy diet and regular exercise, over-the-counter non-steroidal anti-inflammatory drugs (NSAIDs), opiate medications and epidural steroid injections. Prolapsed discs can also be prevented by maintaining proper posture and using proper form when lifting items. If conservative treatment options are unsuccessful or the patient’s condition is severe, surgery may be necessary.